However, due to financial strain, we unfortunately have been having issues getting the funds together to keep this website up and running. 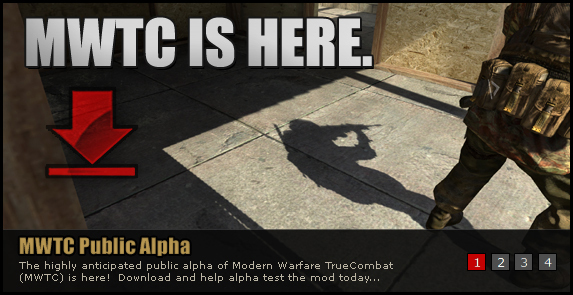 We pride ourselves to remain an official archive for all of the TrueCombat series of mods. We want to keep the spirit (and downloads) of this classic mod alive so that new generations can learn (and perhaps play - even if only against bots) for many years to come. So please, if you are able to scrape (even $1) to help contribute keeping this site up (because we refuse to have ads spamming everyone), we encourage you to do so via Paypal by clicking the link (or image) below, humbly. 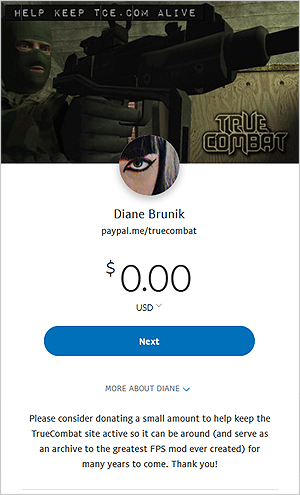 Thanks to YOU, our loyal TrueCombat community, we have raised enough money to keep the site up for 3/4 of a FULL YEAR... in just 24 hours!! Thank you so much again to all who have donated - and a special THANK YOU to Headup Games for becoming TC's sponsor for the next 2 years. NOTE: Former TeamTerminator member, Law (he did Diane's "job" - and MUCH more - before he left TT well over a decade ago), is their CEO and Founder. Congrats to him on his well deserved success! Thank you for your generous donations! Although most TrueCombat versions are 100% free to play (and have been "dead" for a decade or more), you showed that you truly care and want to preserve its memory online via media and downloads. Your kindness is greatly appreciated! Thank you, again, humbly.